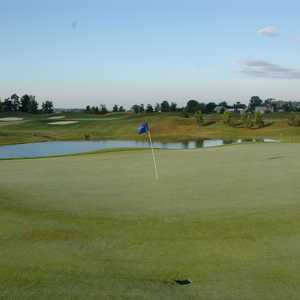 LAGRANGE, Ohio -- Golf course architects often say that designing a golf course is similar to painting -- you start with a blank canvas and go from there. But sometimes the land golf courses will be built on has incredible aesthetic features that already put most of the picture on the canvas. Let's get one thing straight right away: the land Grey Hawk Golf Club was built on didn't have any such features. "What we had to deal with was old farmland that was very flat," says Grey Hawk project architect Mike Smelek of the prestigious golf course design corporation von Hagge, Smelek and Baril. "There was one little area of trees in the middle of the property and a ditch that drained some of the water but wasn't pretty to look at. So our challenge was to take an average piece of ground and create 18 holes of golf that were unique and distinct from one another." To say this was a daunting task would an understatement the size of Tiger Woods' Nike endorsement check. I mean, imagine if someone gave you a knife and asked you to make Roseanne Barr look like Julia Roberts. I'd already be a fifth of the way through a bottle of Jack Daniels at the clubhouse bar. But von Hagge, Smelek and Baril is a design firm known for such world-class tracks as Doral Country Club, La Costa Resort and Spa, and the TPC at The Woodlands. If anyone was up to the task, it was them. So how do you create your own uniqueness on a property that is not inherently unique? "You create your own topography," Smelek says. And that means moving a lot of dirt - 550,000 cubic yards, to be exact. The first gouge was taken out of the earth in fall of 2002, most of the course was planted in 2003, and this year the semi-private upscale course expects to greet golfers with open arms on July 4. 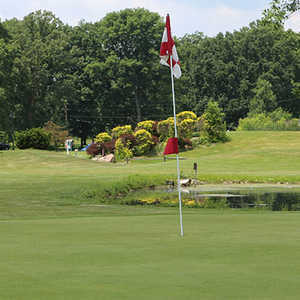 The course in many ways resembles another von Hagge, Smelek and Baril design down the road -- Red Tail Golf Club in Avon. Both feature copious amounts of bunkers, water and mounding, the kind of stuff that can lead golfers to walk off the course gibbering madly after having deposited their clubs among the fishes. But Smelek prefers to see these hazards from a different perspective. "From a strategic standpoint, we use mounding and bunkering and water as descriptive signals," he says. "Their job is to tell players when they're standing on the tee the type of shot they need to hit. Where's the ideal landing area? Is there an opportunity to take advantage of the hole? Sometimes signals will tell you the direction a hole turns or tell you to hit away from a certain feature or, if you challenge that feature, that you can be rewarded." Those features are also created for aesthetic purposes, and often times orientation is everything. For instance, the par-4 12th hole of Grey Hawk plays south and features grass bunkers on its left side for a reason. "That series of grass bunkers works on that hole because the sun rises in the east in the morning and the bunkers create that light and shadow that you see," Smelek says. "If the hole played north, you'd hardly notice those features." Grey Hawk is part of a residential community, but thanks to the purchase of an additional 30 acres of land at the outset of the project, no golfers will have to worry about being chased off private property by a yuppie brandishing a Swiffer mop. "Ideally, in a residential golf community, the one thing you don't want is housing on both sides of every hole," Smelek says. "The way it worked out is that we don't have a single hole with housing on both sides. 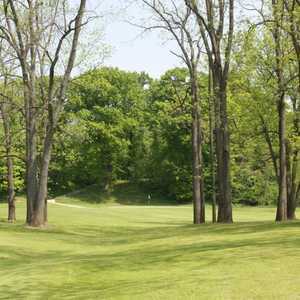 And there is a nice, big green space between the course and the residential areas." According to Smelek, Robert von Hagge was one of the first golf course architects to design an island green. Those linksters who fear water might want to close their eyes here: von Hagge's fondness for the feature is represented by Grey Hawk's par-3 11th hole. But don't blame Smelek and his design team. "In the original design, we weren't going to go with the island green but just make it a peninsula," Smelek says. "The owners (developers), however, asked for it." High handicappers needn't worry, though. As you move forward on the tees, the angle to the green changes so that you can take advantage of mounding behind the green that serves as a backstop. Smelek feels overall that the course is designed with golfers of all skill levels in mind. "The widths of the corridors between the houses and the golf course that we suggested were for safety and playability, but that allowed us to create a course that at times can look intimidating," he says. "But the fairways are generous, and there is a great variety of pin placements on the greens. There are some places where you have to hit the ball in the air to advance it (the island green), but to compensate for that we have four tees on each hole." One has to wonder how much those tee areas will help when there are 85 sand bunkers, including enough sand to fill Miami Beach surrounding another island green on the par-4 3rd hole of 341 yards. After a few holes, you might wonder whether you'd be better off sitting at the top of a tree taking it all in like the resident grey hawk that calls the course home. But at the very least, you'll get your money's worth and feel like part of the country club set for a day. It is sad, that someone with such talent has attached his name, to this golf course. It is not managed correctly and the staff do not get paid.